I'd love to get some pictures of the recital from someone! I'm always so busy on recital night I end up without pictures. There were four teachers involved this year....Jody Johnson, Becky Maker, Shelley Carey and Yours Truly. 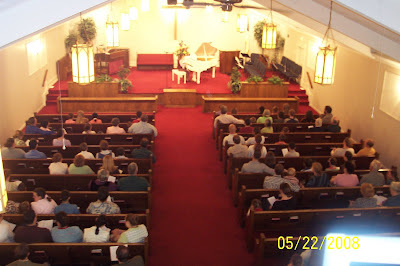 This was the first recital where all 3 of our kids performed. Kayla did a Twinkle violin duet with me. Karissa played Open Taca. Caiden demonstrated some "pre-twinkling skills" and sang Twinkle Twinkle Little Star. Suzuki's philosophy was that every child is born with ability...and that they learn music as they learn a language. By hearing and imitating. So children as young as three (or younger) can begin learning their repertoire. They learn positions and sing and clap the songs they will be playing. They basically memorize their songs before they even start playing, when it begins this young. Many Suzuki teachers will not let a young child hold a real violin until they have demonstrated that they can sing and clap the twinkle variation rhythms correctly. Well....Caiden can do that. He runs around the house singing the toughest rhythm. Problem is, he just turned two! So I think we'll be holding him off on actual instrument playing. Another thought from this recital: I am thinking of nixing the reception after my recitals. At this busy time of year, it seems people might just as much prefer to go to Dairy Queen or go home and go to bed. We'll see. Hi! I got referred to your blog after I posted on mine looking for info about Suzuki Violin Method (We have mutual friends). I have done a bit of reading about the philosophy and think that this is the way we will go with our kids for beginning music lessons. I'd love your feedback on what kinds of things I should ask the teacher when I go to meet with her. My kids are 2,5,and 6, we are looking to start the older two in the fall. Thanks!